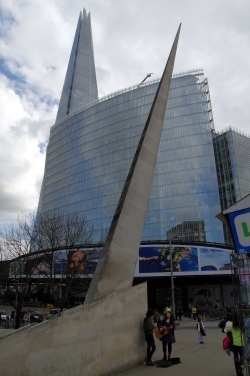 A 16 metre long splinter of stone sticking up in the air at the southern end of London Bridge, the Southwark Needle (its official name is actually the Southwark Gateway Needle) was erected in 1999. Made of Portland stone and sitting on an angle of 19.5 degrees, it was designed by Eric Parry Architects as part of the Southwark Gateway Project which also included the creation of a new tourist information centre. There’s been much speculation about what the pointed obelisk actually represents with some believing that the sharp spike is a kind of memorial to those whose heads were placed on spikes above the gateway which once stood at the southern end of London Bridge. It seems, however, that the subject remembered in the monument is rather more mundane – it’s a marker and apparently points across the Thames the Magnus the Martyr church which marked the start of where London Bridge was formerly located (several metres to the east of the current bridge’s location). And for those trying to figure out how the needle points to that, word is that is the line of the base of the marker which points to the start of the old bridge – not the sharp end of the obelisk. The needle is now commonly used as a meeting point.